When you begin your genealogy search into your family history, especially if you begin online, you'll be looking through sources that have almost certainly been transcribed from the original documents. And as you go further back, you'll probably be reading transcriptions (and even making your own) of handwritten documents. After all, it's less than a century since the typewriter came into common use. In genealogy there's no substitute for original records, which are known as primary sources. You can view a transcription and even use it in your research, but ultimately you still need the original document (or an exact copy - photocopy is best) for corroboration in your family history records. Primary genealogy sources are those created on or about the actual time of an event. That, of course, makes them the most reliable. Even those created a short time later are bound to have a question mark over them. They're more prone to errors of date, spelling and place, usually by accident, with a person writing from memory. 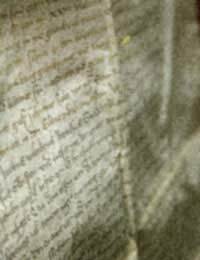 Reading the handwriting on documents can prove to be a problem in genealogy, and the further back in time you go, the greater it becomes. At times it's a matter of comparison and deduction. For instance, on the 1881 census, the handwriting made one man's occupation look like "book repairer." Ten years later it read "boot repairer" - which makes a great deal more sense. You'll undoubtedly encounter similar things during a genealogy search that make you scratch your head in puzzlement. If the spelling in a document confuses you (and it might), compare the words with others on the page. Try saying it aloud: when you do that in context, it's often possible to decipher it. With older records you need to be especially aware of handwriting in your genealogy search. They'll contain phrases, misspellings and words that seem very unfamiliar. For example, most people know that Ye means "the." But the y in ye is what's called a "thorn," a particular way of writing "the." So it's not exactly a quaint old word at all, just a way of writing - something to be aware of for family history records. The further back you go when tracing an ancestor, the more problems you'll encounter, not only with the writing itself, but with phraseology and meaning. If you're going to be spending a lot of time in the Middle Ages, a course in paleography is a good investment if you're serious about genealogy. You'll earn the commonly used abbreviations of the period, the principles of letter creation, and how to decipher the writing. paleography was actually developed in the 13th century as a tool to distinguish real documents from forgeries, and it's still useful today for checking genealogy sources. In your genealogy search you'll undoubtedly spend plenty of time reading transcriptions of records. You need to be especially careful here. If possible, have the original source (or more likely, a copy) beside it to compare spellings and phrases. Errors can send you off hunting down the wrong path quite easily, looking for family history records that don't exist. Often, however, these secondary sources are all you might have to go on. Certainly they can simplify the genealogy search, but you shouldn't rely completely on them. Wherever possibly, verify against the original genealogy sources. If you're transcribing something, record it exactly as you see it. Even if a surname of an ancestor is spelt several different ways in the same document, put them down as they're written, rather than revising. When you've finished, check through very carefully for errors.